Eyeliner is often the bridge between “drab” and “fab,” but it can easily run away (literally) in hot weather. Here are five tips to keep your liner in place and looking fabulous all summer long! Whether you be sitting in a cubicle or enjoying happy hour with friends, a poppin’ makeup look is the ultimate mood booster. Eyeliner is often the bridge between “drab” and “fab,” but it can easily run away (literally) in hot weather. No one enjoys a smudged cat eye, but when humidity dominates the forecast, it’s basically impossible to escape. Before you take the POP Kajal Liner from your July box for a test run, keep reading for five ways to keep it in formation under the summer sun. All About That Base: Priming is such an underrated part of the makeup application process. Long story short–you should always do it. When applied before the rest of your look, primer becomes the protective barrier between clean skin and the nasty side effects of makeup. We can’t completely avoid wrinkles, breakouts and other beauty woes, but priming makes them less frequent. If you want to keep your liner from running, prep the eyelid with a primer to ensure that it sits still. 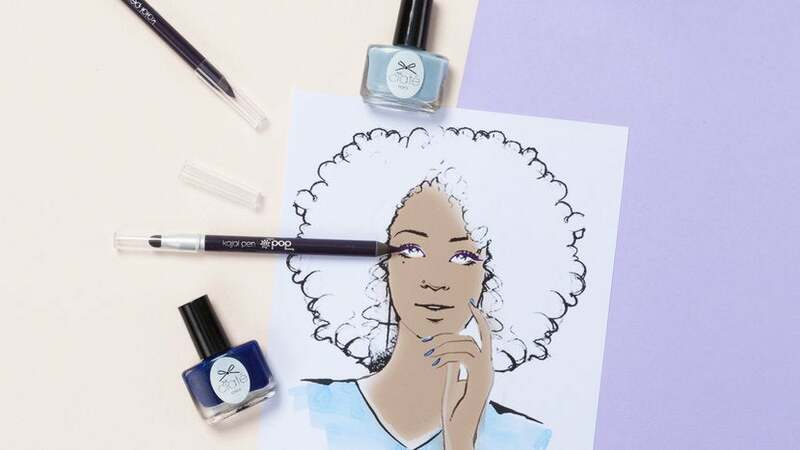 Draw Your Wings Up & Away: For makeup novices, drawing a perfect cat eye is the ultimate dream. Whether it take three days or three years to master, it’s important to steer away from watery eyes, especially during the summer season. In addition to keeping your lines thin and close to the lash line, be sure to draw the wing up and away from the outer crease of your eye. Mix and Match: Blending your liquid liner with powder shadow is an ideal way to keep makeup from running when you don’t prime (see above). First, break a small piece of shadow onto a clean surface. Next, dip a disposable applicator in your liquid liner and follow with a swipe of shadow. Apply to the lash line and blend out even more if you want a quick smoky eye. Keep It Clean & Waterproof: Contrary to popular belief, priming is not the first step of makeup application; cleansing is! A clean face is the perfect canvas for makeup that sits even, smooth and free of dirt from the previous day. Additionally, if your eyes are sensitive to even the tiniest swipe of liner, stick to waterproof and/or eco-friendly formulas. The POP liner is particularly amazing for watery eyes because it’s made of kajal, a blend of natural ingredients. Stash A Swab: Beauty emergencies are inevitable, but that doesn’t mean you should put an entire makeup counter inside your purse. Cotton swabs are suitable for any on-the-go fix, including smudged eyeliner on a hot summer day. If you don’t have makeup remover on hand, run the swab under a faucet and use the damp tip to remove excess makeup from the corners of your eye.